Health and wellness is as important as ever and when it comes to corporate promotions, drinkware is always a big hit. After all, hydration is one of the most widely recommended elements of healthy living. According to the Institute of Medicine, the adequate intake of total beverages for men is roughly 13 cups (3 liters) per day, and for women about 9 cups (2.2 liters) per day. So it’s no wonder promotional drinkware is an integral component in the list of merchandise we recommend for health and wellness promotions. Whether the recipient is an avid fitness lover or a newbie, either can appreciate being given a quality shaker bottle and newbies might even be motivated to workout by having a new cool bottle. First Off, What is a Shaker Bottle and What are their Key Features? Some shaker bottles have floating components like a mixer ball or whisk. Others, like the Cyclone, have keep their mixing mechanism stationary. When you shake, the friction does the blending, and since many of these powders do not fully dissolve having the ability to remix with a few shakes is a great benefit over electric machines. The Cyclone Cup is another brand name shaker bottle with a really impressive appearance. The construction quality and material are clearly superior to most of the basic bottles. This bottle fully disassembles for easy cleaning and features the Cyclone mixing technology that moves against the flow of ingredients for easier and smoother mixing. This “Cyclone” is built in and doesn’t float around inside the bottle. Even better…there is a screw-in bottom compartment which you can store your protein powder or meal replacements right up until you are ready to mix! We also sell the Contigo brand shaker bottle – click here for Contigo. 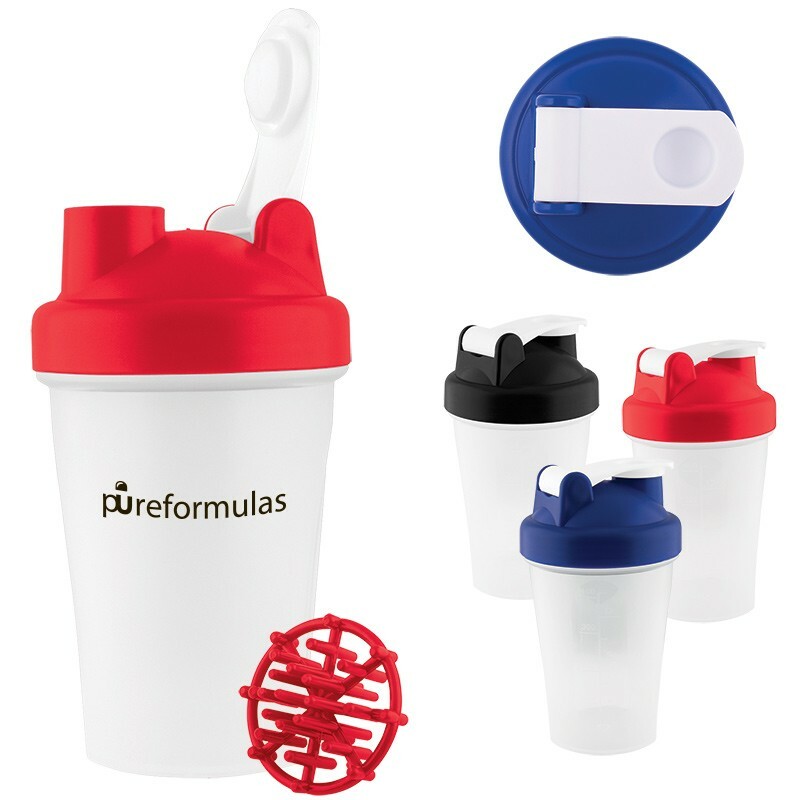 Shaker bottles can add an element of fun and convenience to your customer’s life. They are such a desirable item with a high perceived value making them a long lasting promo pick! If you are looking for other drinkware options that help promote wellness check out our infuser water bottles! These bottles remove the hassle of buying expensive flavor waters that are high in sugars. All you have to do is insert fruit or veggies into the infuser and add water. Forget about boring water, now you can enjoy staying hydrated! See our entire collection of Shaker Bottles & Infuser Water Bottles here! Revablend Twisting Water Bottle – 20 oz.